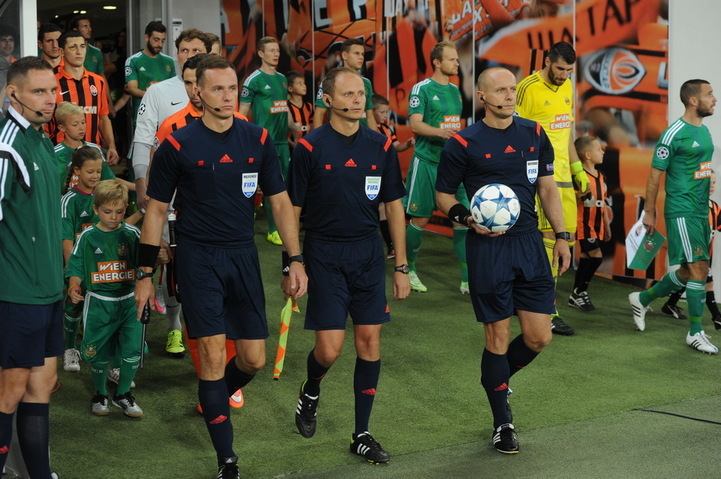 On August 25, Lviv hosted the second leg of the Champions League play-off. The Pitmen played a out draw with Rapid Vienna to reach the group stage of the competition on aggregate. The Pitmen’s head coach Mircea Lucescu held his 200th game in the European competitions as the coach. Compared to the first match of the opponents in Vienna, there was one change made to Shakhtar’s starting line-up: Serhiy Kryvtsov and Yaroslav Rakytskyy played at the heart of defence, with Oleksandr Kucher remaining on the bench. As for the Austrian side, the visitors’ squad remained the same as one week ago. The Pitmen went on the offensive from the off and as early as on 10 minutes they forced the opposition defence to make a mistake: defender and goalkeeper did not play confidently, the ball bounced to Marlos, who fired it into the top far corner of the net with his left foot to make it 1-0. Rapid’s quick response proved to be unexpected: Schaub seized on the mix-up inside the Pitmen’s defender to net an equaliser. The Pitmen continued attacking despite conceding a goal, and Marlos came close to repeating again the goal he scorer earlier – the ball flew just wide of the post. On 22 minutes, the Austrian side won a dangerous free kick: Rapid’s captain Hofmann sent the ball over the wall and into the net to make it 1-2. After five minutes, Shakhtar levelled. Darijo Srna delivered a cross into the penalty area, the Rapid defender failed to handle the ball properly, with Oleksandr Gladkyy shooting into the near corner of the net to make it 2-2. Then, open football followed, the ball was hardly seen in the middle of the pitch. Shakhtar’s attacking moves were far more dangerous, and Gladkyy had the best chance to score: following a pass from Alex Teixeira, the Pitmen’s forward came inside the penalty area to shoot into the near corner – Rapid’s goalkeeper beat the ball away with his feet for a corner. The Pitmen’s defenders were also involved in the attacking moves, as in the episode when Rakytskyy delivered a cross during a counterattack only for Kryvstov to head the ball just wide of the goal post. The first half ended 2-2. After half time break, the teams played in a more cautious fashion. The Pitmen did not rush things, trying to control the ball for longer periods of time and hitting the Austrian side on the breaks. The visitors had to score but they did not have a lot of chances. On 68 minutes, the referee stopped the game as well as Shakhtar’s dangerous attack, awarding Dibon a yellow card for his foul on Gladkyy. In the closing stages of the game, Shakhtar made two substitutions: Eduardo and Bernard took to the pitch. Shakhtar were attacking more often, and Rapid went on the offensive more energetically right before the end of the match. On 90 minutes, the visitors’ counterattack proved to be dangerous: after a cross from the flank Beric headed the ball wide of the goal post. In the stoppage time, the teams took two dangerous free kicks. Rakytskyy fired the ball over the crossbar, and a Petsos shot was parried away by Pyatov – Prozenik tried to seize on the rebound but the ball hit the goal post. By that time, Rapid were already down to ten men after their player was sent off. A final score of 2-2 fully satisfied the Donetsk team, who reached the Champions League group stage for the eleventh time in their history. The Pitmen will discover their future opponents on Thursday during the draw.